For your holiday on the Costa Dorada, we offer you this nice apartment in Cambrils, with 2 bedrooms and sleeps for 6 people. 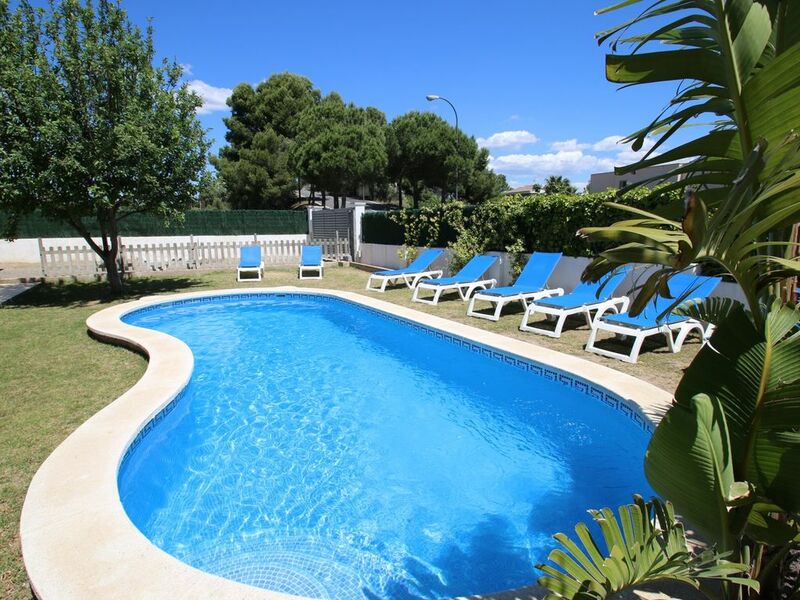 Casa Rosales is located in the residential area of La Llosa in Cambrils, just 400 meters from the beautiful sandy beach and 10 minutes walk from the port and shopping center of Cambrils, only a few kilometers from Salou and Port Aventura. The cozy apartment on first floor consists of a double bedroom, a triple room, a living room with a sofa bed, a bathroom, a kitchen and a beautiful terrace. The house is surrounded by a beautiful garden with lawn and fruit trees, with access to the community pool with sun loungers. The property is very well equipped for a comfortable stay: dishwasher, washing machine, satellite TV, Internet Wifi throughout the building and parking. Spacious apartment in quiet location, ideal for families. Having a car would be useful. Lovely pool, it is small so it can get busy if there are a lot of guests down at the same time. The property does not have air conditioning, we did have a fan for each bedroom but it was very hot & uncomfortable at night. It is at least a 20 min walk to the Port which is where the restaurants & shops are. The nearest supermarket is a 10 min walk which is quite far to carry shopping & water back from each day. Especially if it is hot & you have children. Most of the other guests did have cars which would make things a lot easier. The local beach is popular but has a strip of stones along the shore line which can cut your feet. We walked to the beach at the port but again it´s a long walk for young children. Sobre todo la tranquilidad de la zona y la piscina. Un recurso fantástico psra pequeños..y no tan peques. la tranquilité du lieu tout en étant à 10mn du port à pied.Très bel endroit, à refaire pour de prochaines vacances!